Young larvae initially consume leaf tissue from one side, leaving the opposite epidermal layer intact. By the second or third instar, larvae begin to make holes in leaves, and eat from the edge of the leaves inward. 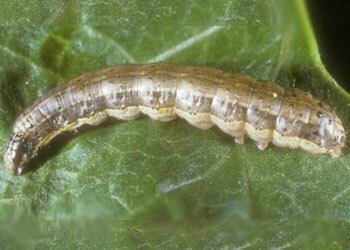 Older larvae cause extensive defoliation, often leaving only the ribs and stalks, or a ragged, torn appearance. Larvae also will burrow into the growing point (bud, whorl, etc. ), destroying the growth potential of plants, or clipping the leaves.